Research your prospective employer – Learn as much as you can about the company, it’s products, services and/or technology before the job interview. Find the company web site and review all the information you can find about the company. 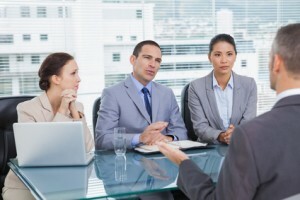 Be prepared with some interview questions for your potential employer. Be enthusiastic – This is your chance to sell yourself. If you begin the interview thinking it’s not your ideal opportunity and don’t make an effort to sell yourself, but later change your mind, it might be hard to backtrack. Be sure to express an initial interest. Later you can decide if you want to accept or refuse any offers. Be prepared to ask them interview questions – This demonstrates your interest in the opportunity. While you research the company before the interview, jot down any interview questions that come to mind. Do not ask about salary or benefits during your first interview. Show that you are more interested in the position and it’s future rather than salary. If you have questions about compensation, discuss them with your Consultant. Arrive for the interview 15 minutes early – Be prepared to fill out paperwork and take tests if necessary. Take your cell phone with you when you travel to the interview in case you get lost or an emergency occurs in route. If you cannot keep an appointment, give as much advance notice as possible. Follow up with a thank you card or letter – This expresses your sincere interest and also gives you an opportunity mention anything you forgot to mention during the interview. You get an opportunity to sell yourself once more for the position. You will also stand way above the competition because most people do not send thank-you letters. Be sure to get their business card before you leave so you will have the information you need to easily fax, e-mail, or follow up by regular email. If you want the position, say so – It might be the difference that gets you the job offer. Call your Recruiter immediately after the interview – We will help you get the job offer and need your feedback to work with your prospective employer. Once you accept an offer, tell us immediately so we don’t continue to send candidates to that employer. Where do you want to be 5 years from now in your career? Why do you want to leave your current position, or why did you leave your last position? What did you like best/least about your last position? Why? What achievement are you most proud of and what has been your biggest professional challenge? Describe a difficult problem you solved and how you solved it.